Colourpop has been out for a long while and I finally succumb to temptations and ordered myself a couple of the Colourpop Super Shock Shadows myself after hearing all the good reviews! Plus at USD 5 a pop, it’s not too much of a loss even if it’s not as good as the review say. You can now ship directly to Singapore on Colourpop. Alternatively, one can go through Ez-buy where shipping is actually much cheaper if you are not buying a lot. The texture of these Super Shock Shadows is pretty interesting. It feels like cream or I would say mousse. But it dries to a nice powder finish. Which is great because you do not have to deal with fallouts as with the usual powder shadows formulas. One thing to note is that you have to keep these shadows tightly capped if not they will probably dry out very quickly. You do not want that to happened even though these shadows are like super affordable. After exchange rate and shipping, each shadow is probably around $8.50 or less. Is spending USD 5 each worth for these shadows? Are they worth the trouble to get via an agent or the hefty shipping price? 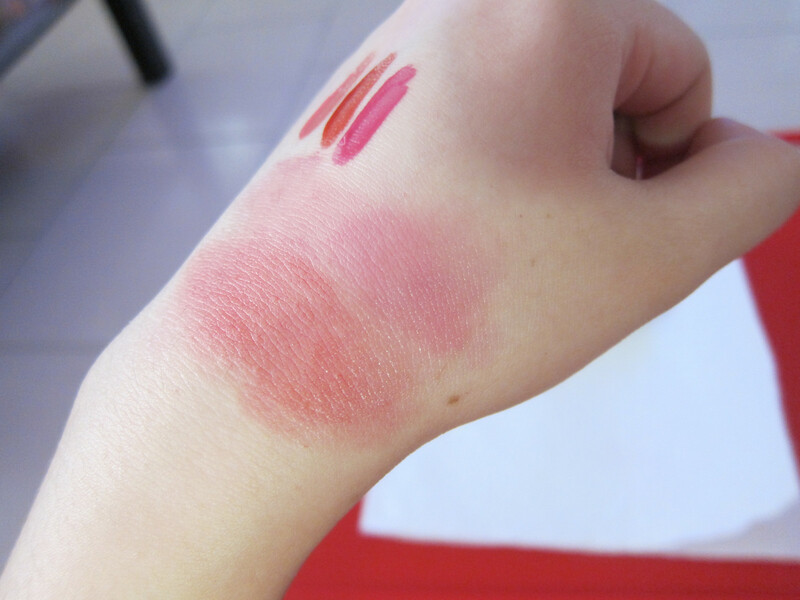 But do read up on the reviews and look up on swatches online before deciding which to get. Because not all shadows are made equal! The star of my haul is definitely Liberty in the Ultra-metallic finish. I feel that you can’t go wrong with this finish and also the metallic ones! Lasting power wise, they hold up for decently for a day at work(10 hours approx) without primer! Have you gotten any of the Super Shock Shadows? Let me know which is your favourite! 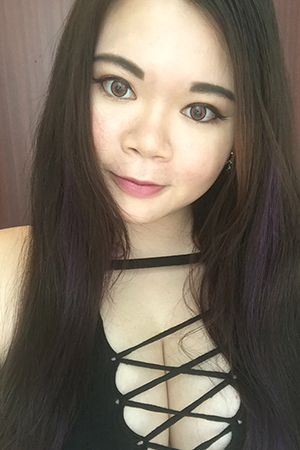 So H&M beauty was launched recently and how can I not check it out right? Especially I’m pretty much a H&M fashion person, ditching my usual F21 and New Look(No longer in SG) when it first opened in Singapore. For $9.90 a pop, the shadows are of pretty good quality with decent colour payoff. Not all shades are equal though so do a swatch before making your choices. I’m pleasantly surprised that their mattes are pretty smooth, good in pigmentation and most importantly not chalky at all. These singles are also better than the palettes that H&M also carries. These stains are sweet and I meant it literally. They have this sweet candy taste when applied and makes you felt like eating them. Lasting power wise is decent but it does leave behind a very light stain to keep the colour. I think there’s a total of 6 or 7 shades for this range. Instead of the usual creamy lipsticks, I decided to go with this Metallic one with such a lovely colour payoff. It’s smooth and creamy and the colour definitely pops when worn! Sugar & Spice is one of the brighter and wearable shades in my opinion. There’s an actual gold metallic one which is pretty awesome if you want to rock the gold lip look for Halloween. 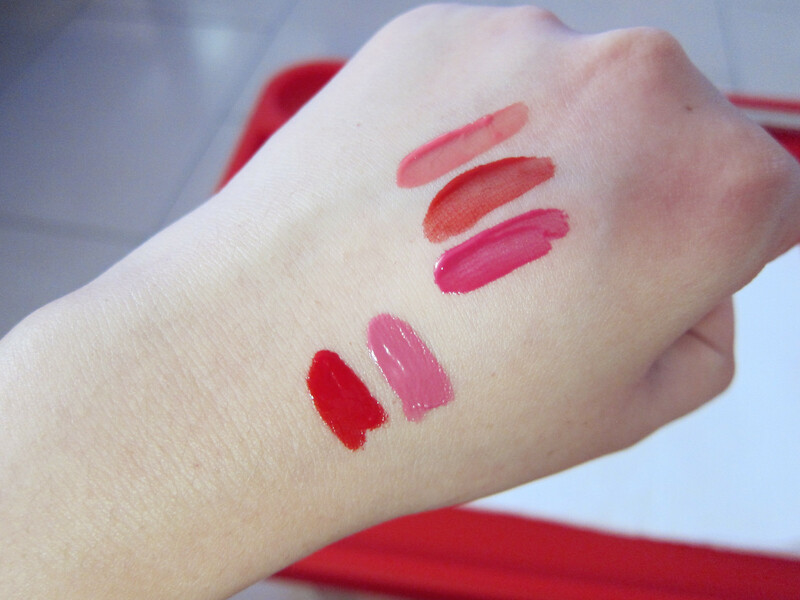 Here’s the swatches of the H&M Beauty Lip products I’ve bought. The range of products is quite extensive from lip pencils to eye shadow palettes to foundations and even face masks. Definitely very affordable but I must say that not everything is value for money. For an example, the micellar water is totally passable. Save that $9.90 and get something that actually works better at Watsons. Lips sticks and single eyeshadows are worth to check out. $2.90 a pop for a mask is not too bad either. I swatched the blushers and some powdered bronzers and they are mediocre. But for that price tag, they are pretty decent. 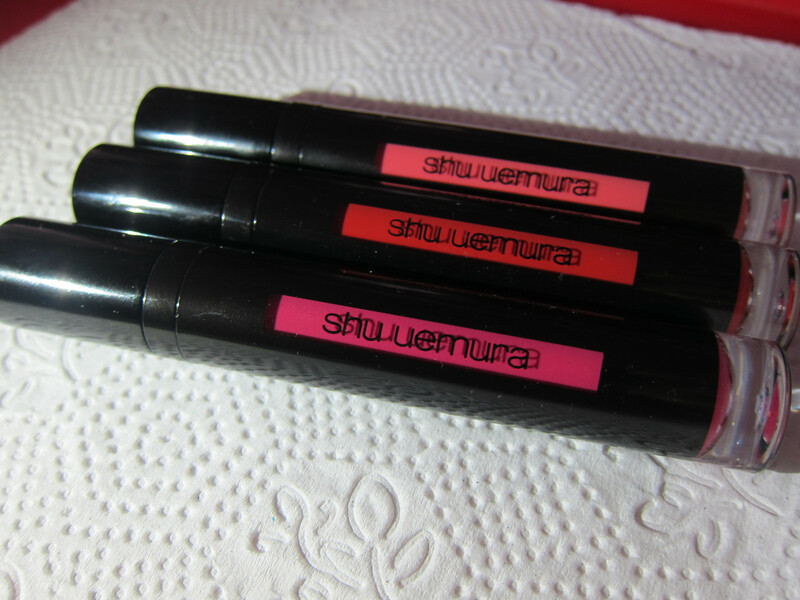 Shu Uemura recently launches their new range of lip product which is the Laque Supreme. The Laque Supreme is a liquid lip product with a glossy finish. 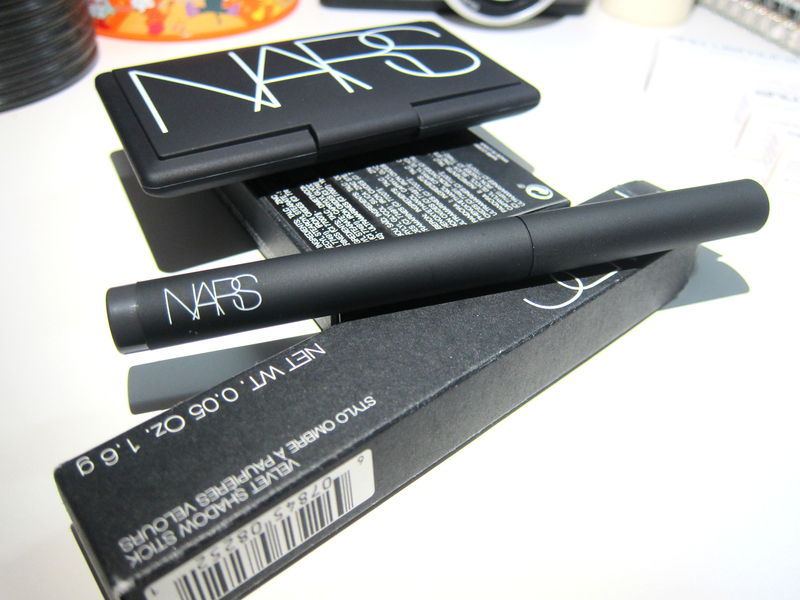 I got 1 when I was picking up the Metallic Ink liner and got another 2 as I really like the product. I’ve gotten 3 shades, which is CR01, RD03 and WN02 respectively. 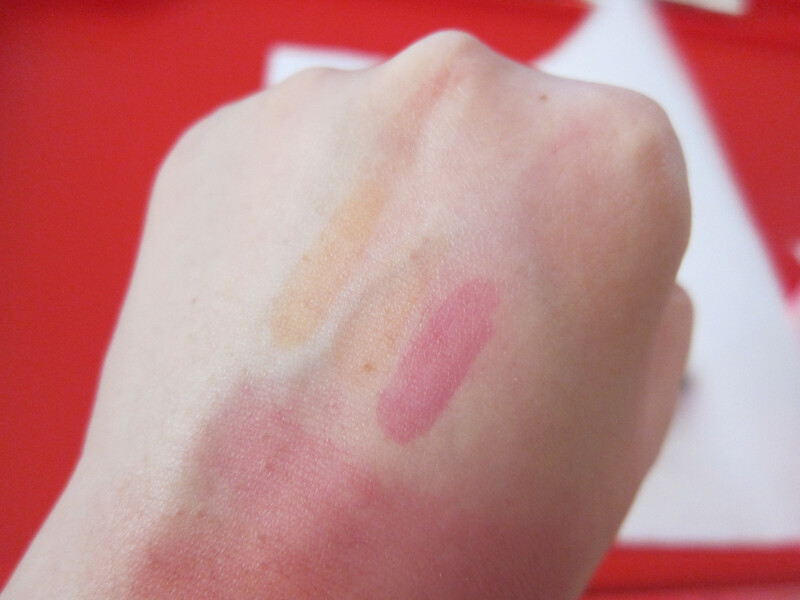 Here are the swatches of the Laque Supreme in CR01,RD03,WN02 from top to bottom. I realized that the consistency of the product kind of differs from the color. WN02 has got the best consistency in terms of color pigmentation. It covers the lip nicely with just one coat of color. As for CR01 and RD03, the consistency is slightly more watery and it requires two to three coats of color to get a nice even coat. Regardless, they all give a nice sheen of shine which is not too over the top. The shine does goes off after a few hours of wear and leaves a nice stain on the lips. I also like how the finish is glossy but doesn’t leave a sticky feeling after it sets properly! Wears very comfortably on the lips. Longevity wise, it’s really 5 out of 5! I wore it during CNY visits and they lasted me the whole day with loads of eating and drinking. Here’s a photo of the stains on the back of my hand after wiping excess product off. The stains are pretty stubborn which contributes to the longevity of the lip color I guess. As you can see, even WN02 leaves behind the most pigmented stains. The Laque Supreme is pretty similar but also pretty different from the Tint In Gelato range also by Shu Uemura. The Tint In Gelato was launched early last year and I picked up two at that point of time as I really like the creamy texture and the great pigmentation. I guess it will be good to do a mini comparison between this two products since I have them both. Here’s a swatch of the Tint In Gelato by the side of the Laque Supreme. AT01 and PK02 from left to right. 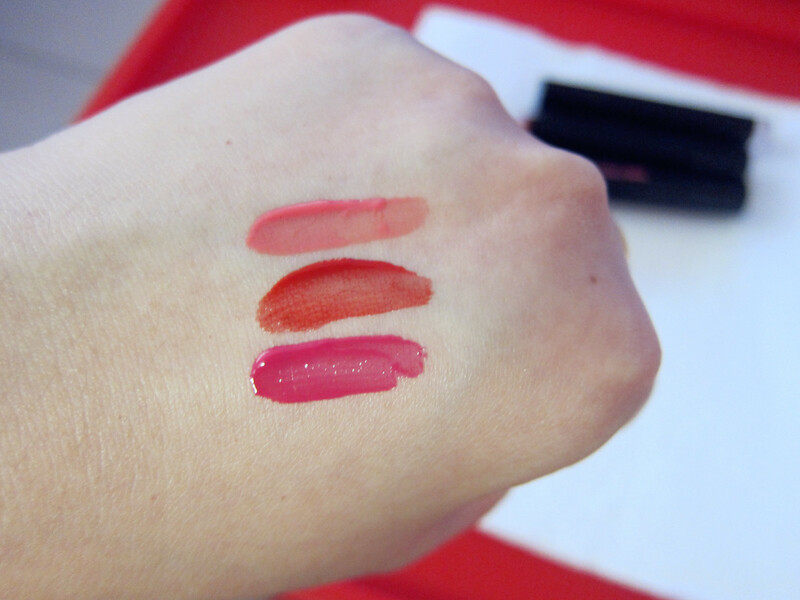 You can see that it’s more pigmented and more creamy whereas the Laque Supreme is more watery. Also the Tint In Gelato is kind of a two in one product. It can also be used as a creme blush. The Tint In Gelato finish is more matte and when used on the cheeks , it feels almost powdery. Here’s how the Tint In Gelato looked liked when it is blended out. There’s kind of too much product here, but with the right amount used it will give a nice sheer color on the cheeks.I kind of really like this product as it’s very convenient for travels. However, the longevity of this on the lips is pretty average. It lasted longer on the cheeks as a blush. Here’s a photo of me wearing the Tint In Gelato in PK02 on both my lips and cheeks. This is me wearing the Laque Supreme in RD03. Overall, I would say the Laque Supreme and Tint In Gelato is two different products. 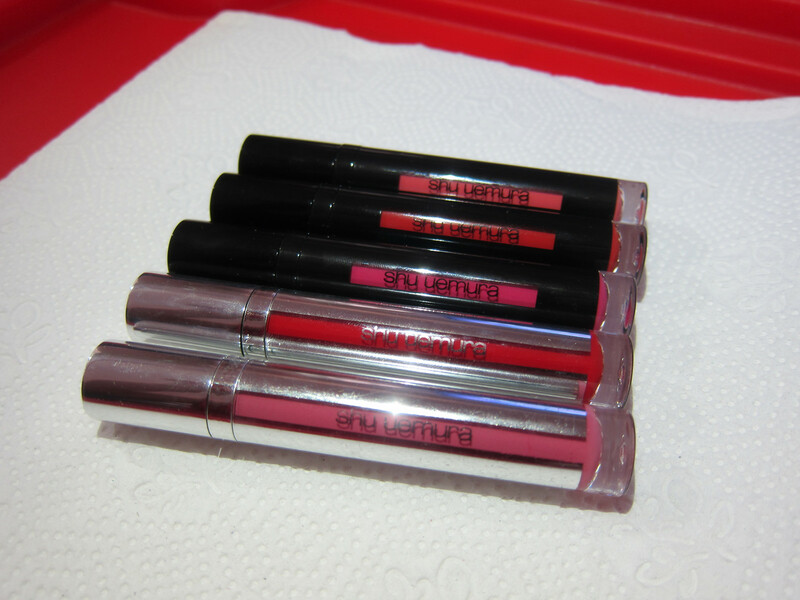 If you like long lasting lip colors with a glossy finish, the Laque Supreme is the choice to go. If you like some versatility in your products and prefer matte finish, the Tint In Gelato is a good choice. Personally, I would pick up the Laque Supreme for daily use as I am someone who is lazy to touch up. But I would pick the Tint In Gelato to be in my pouch when I’m going overseas as it’s really more convenient. The Laque Supremes(0.18 Oz) are retailing at $40 and the Tint In Gelatos(0.19Oz) are retailing at $38. Hope this post is useful! Hello! I’m back with my beauty haul for the month of February. This post comes early as I want to peacefully enjoy my upcoming Chinese New Year holiday. Hahaha. So I read about the NARS Eye-Opening Act spring collection from Makeup Stash (Swatches available in her post) and the palettes caught my eye. I was especially drawn to the Inoubliable Coup d’Oeil palette which is more towards the cool tones as compared to the other one in the collection. I like how the palette consists of mostly matte colors which I lack in my collection hence I had to add it to my haul. This palette is retailing at $65. I also got one of the Velvet Shadow Stick. It swatches really smooth on the hand and I think this is great as a base and for smokey eyes. I got it in Reykjavik which is a nice dark grey. This retails at $44. I wanted to get the Navy one at first but I decided that the dark grey one will be more universal in terms of the colors I can pair it with. 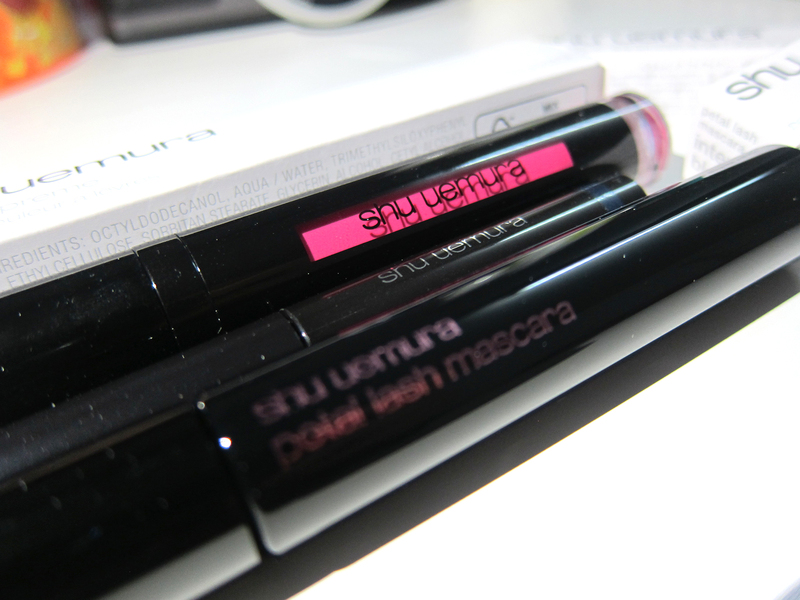 I also dropped by Shu Uemura counter as I wanted to check out their new Metallic Ink eyeliners and I also had a $40 voucher that I could use. Brands like Shu Uemura and YSL both have loyalty programs that give you rebates in forms of vouchers once you hit a certain amount. I think you just have to spend minimum $150 to join the club. $1 to a point so it’s not that difficult to accumulate. Every 500 points for a $40 voucher at Shu Uemura and every 1000 points for a $100 voucher at YSL. Points expires once a year. I had 700 over points at YSL which expired cause there nothing else I wanted to get at that time. Such a waste. 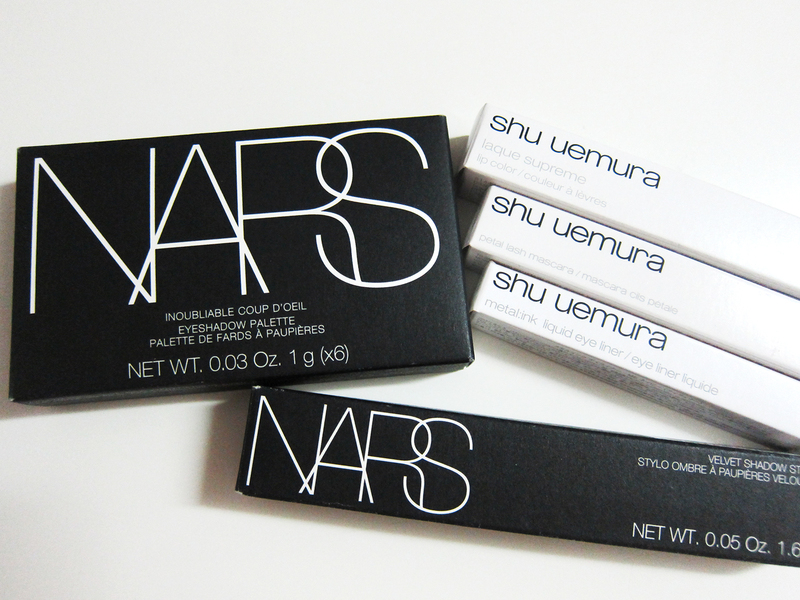 Back to the haul, I ended up getting 3 items from Shu Uemura. One of the Metallic Ink in Navy, the Petal lash mascara which I’ve been wanting to get and the new Laque Supreme in WN02. Both the eyeliner and the Laque Supreme is at $40 and the mascara is at $50. I’ve used the Laque Supreme already and I’m in love with everything about it other than the fact that it gets a little drying at the end of the day. The color lasted me the whole day through eating and drinking! I need to get more of this liquid lip color! It have a nice glossy finish by the way. I would probably do a comparison post of the Lacque Supreme and the Tint In Gelato by Shu also so look out for it! So 5 items this month, and highly possible I might get another couple of the Lacque Supreme. I can’t wait for March to come as I’ve exciting news to share with you all! Hope you enjoy reading my beauty haul ramblings!